Why should you choose us to service your rotary screw compressor? Disco was one of the very first companies to rebuild rotary screw compressors in the Texas panhandle and Kansas gas fields back in the early 1990’s. It was a natural fit for us because we are a machine shop first and foremost. We will be able to take your rotary screw compressor and determine what exactly needs to be done to get the compressor back up and running. By tearing down the rotary screw compressor, it can be determined what the cause of failure was and what exactly needs to be done, which will then allow for an estimate to be given on the cost of the repair and an estimate of how long the repair will take along with detailed pictures of our findings. Even though the turnaround time can vary depending on what shape the compressor is in when it is brought into the shop, we have a standing inventory for a variety of parts for a number of manufacturers including Ariel, Sullair, Atlas Copco, Frick, Leroi, I/R, Quincy, etc. and many others, to help minimize the time that the rotary screw compressor will spend in the shop, allowing you to have your compressor back out in a faster time period. One of the components are the bearings within the screw compressors, and these are the parts that fail the most often. This scenario often means that your rotary screw compressor is going to need machine work because of damage to the either the rotors (bearing areas) or the heads. Typical machine work that is done on rotary screw compressors includes sleeving the air gap, and preparing, metalizing, and machining the input shaft, along with other component work. The normal turnaround that you will see for your rotary screw compressor being serviced can be from two to four weeks, but if the process needs to be done faster and is approved, this time can be reduced. What will you find that sets our company apart from competitors for rebuilding rotary screw compressors? The first is the quality of services you get from us. We understand the nature of your business and how “scheduled maintenance” can turn into “We need it yesterday!” We have multiple drivers on standby ready to be dispatched to your location at any time, day or night. it doesn’t matter if it had previously been rebuilt by us or if it is hasn’t had to be serviced yet. We are able to service oil-injected and oil-free rotary screw compressors. We have been working on rotary screw compressors since 1991 and through the vast experience and knowledge of our managers and employees, we have the capability of either replacing or reconditioning a rotary screw compressor. Whether your rotary screw compressor is used with natural gas, ammonia, or air, it is able to be fully repaired or serviced here at Disco. We realize that you may not have the time or the personnel to stop what you are doing and worry about having to remove and re-install the equipment. We will be happy to take these responsibilities off of your shoulders and will send out personnel anywhere within the continental United States to investigate and troubleshoot the problem. 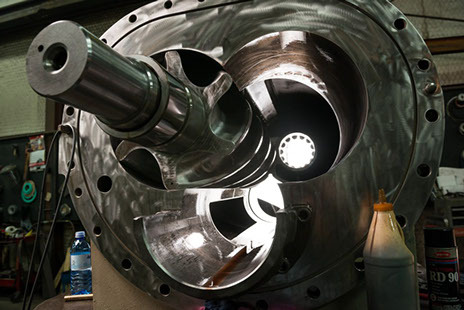 We specialize in custom work and are capable of modifying a number of the components within the rotary screw compressor so that you have the equipment that you need specifically for your application. If you need the compressor to be aligned properly, we have a laser alignment tool that can do just that.